Omae Mitai na Hiroin ga Ite Tamaruka! Once an OL (Office Lady) around 30 and born with memories of her past life, when Tsubaki was around 4 years old, from the words of her half-sister who she also thought held memories of her past life, she recalled that this world was from an otome game. In the game, the half-sister born from a lover was the heroine, and she was the villainess noble girl who tormented her. Furthermore, the END always concluded with a suicide. But in this world, there were a lot of differences in the setting. Thinking that she might be able to save her mother who commits suicide, it’s a story where she does her best in protecting her mother and the main capture target character, her cousin from her half-sister’s devil like clutches. Like Hell It's Okay to Have a Heroine like You! Don't be intimidated by the great wall of text in the first chapters, once the family drama is out of the way (albeit temporarily, with a few loose ends to tidy up in the future), Tsubaki's life is quite enjoyable and entertaining. 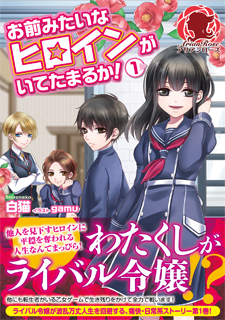 The romance is also slow going, the story having more focus on Tsubaki's school life and friends while she prepares to take countermeasures against the selfproclaimed Heroine. Unlike the rest of her Villainess Noble Girl cohorts, she isn't necessarily acting against or wholeheartedly into her designated role. She just didn't try to resolve the misunderstanding of her character for her own convenience and use it as a shield to protect her family (particularly her mother and her maternal cousin who is one of the love interests) from the 'Heroine' and said heroine's mother. "I have a favor to ask"
"Don't just agree so easily, let her finish! Look at her face, she's obviously going to ask for something troublesome!" "But I trust Tsubaki won't request something that will inconvenience/hurt me in any way"
Read the raws online, may differ from the published version. This review is mostly for personal reminder about the novel. Started out interesting but as the story went on I lost interest. I wanted to know what was going on with all the reincarnated girls but seeing Leon as the main love interest and Kyousuke fall in love with Touko left a bad aftertaste. Maybe the love interests just weren't my type. I mean putting it badly, Leon's over-persistent and it's annoying. It pays off in the end. Some people love this because the lengths the guy goes to to make Tsubaki happy is amazing. I was flipping tables at how much people were trying to get them together at times. *Stares at Kyousuke* Yet it didn't resonate with me. The two main pairs ended up being pretty good matches, if I think about it. Still not the ideal type of relationship I was looking to read about. Loved the family love everywhere and ugh can I just say Asahina Kaoru, you are a cutie. It was a great novel, Its not your typical reincarnated-in-otome-game story, this one doesn't focus on avoiding her death flag instead its to avoid her family & relatives from death routes. Its has a tinged of seriousness and slyness. Im still waiting for the ML to appear but Im expecting it will be a great ML. I totally recommend it. A story with an overdone premise that is actually pretty fun to read. Instead of trying to get revenge the MC wholeheartedly wishes to move on and make her mother and her cousin happy. As it is still the beginning of the story not much can be said but the existing content is very satisfying to read. Also a very special thanks to Ellionora Translation for picking this up and doing such amazing work with the translation.